A stranger enters the inner sanctum of the Ashby family posing as Patrick Ashby, the heir to the family’s sizeable fortune. The stranger, Brat Farrar, has been carefully coached on Patrick’s mannerisms, appearance and every significant detail of Patrick’s early life, up to his 13th year when he disappeared and was thought to have drowned himself. It seems as if Brat is going to pull off this most incredible deception until old secrets emerge that threaten to jeopardise the imposter’s plan and his very life. 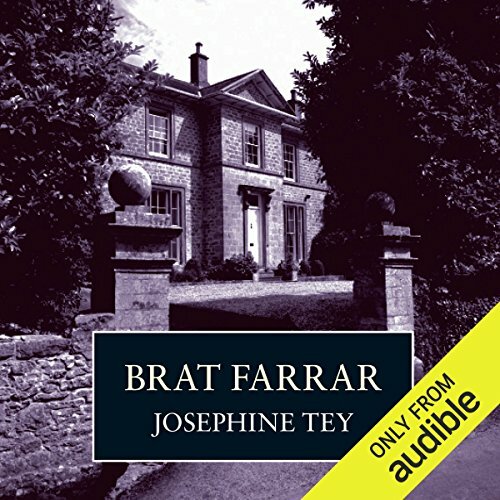 ©1949 The National Trust (P)2014 Audible, Inc.
Where does Brat Farrar rank among all the audiobooks you’ve listened to so far? This is a book I remember from my childhood and I still have the hard cover copy. I loved the story and loved hearing it again after all these years. It was beautifully narrated. Brat Farrar does not follow a conventional mystery format; instead it makes the impostor the hero in a wonderfully nuanced character portrayal. The members of the Ashby family, in particular the warm-hearted Aunt Bee and Brat's mercurial 'twin' Simon are beautifully drawn, and the reader becomes immersed in the comfortable rural England of a bygone era. As the book nears its climax an increasing air of tension makes it a compelling experience. Carole Boyd's narration is fabulous, with her calm English voice dispensing Josephine Tey's elegant language with ease. The characters are well differentiated and their emotions clearly shine through. There are sad events in this book but also a sense of hope, and its effect lingered with me in a way that is rare for any Golden Age mystery. It's a lovely story. I'm a big Josephine Tey fan, and I'm picky about narrators. This was my first Carole Boyd listen, and now I'm hooked. She's just great. Enough variations in voicing to keep the characters identifiable, but no stagey acting to distract from Tey's precise and wonderful story. If you like British mysteries and good narrators, you can't go wrong here. Josephine Tey is dated - this is a bucolic England of the imagination circa 1920s, 30s - but, she has a sharp edge, and is such an elegant writer - and excellent story teller. All of which explains why, even now, her books are a pleasure. This is exceptionally well narrated by Carole Boyd - an excellent match with the material. BRAT FARRAR is a classic of its kind from the Golden Age of British mysteries - Allingham, Christie, Sayers. If you like those, you'll be happy you spent the credit on this. It's very well done. ‘Brat Farrar’ was, surprisingly to me, even better the second time around. The writing, the story, the narration enraptured me once again. And that combination of excellence turned ‘characters’ into people and ‘plot’ into real life experiences. The novel is filled with charming, complex, and also conflicted people and a fascinating storyline that keeps you unsure and guessing until the end. A dearly-loved, favorite to read and reread. This story takes the classic change-of-identity plot and turns it on its head. Set on a horse farm in the English Midlands, Brat Farrar takes full advantage of the beautiful scenery and a family of wonderfully individual characters, with a tragic mystery in its past and a warm and human faith in a future. Sounds sappy, but it carries the reader along, revealing the hidden facts and surprising us all in the process. Simply a lovely, lovely book which makes this reader, at least, wish I had been part of the Ashby family. As expected, Josephine Tey delivers a compelling, absorbing tale that draws one in and doesn't let go. After reading her "Daughter of Time," I knew to expect the highest quality of literate writing and at the same time a delicious, entertaining read. Once again, I was in her power for the whole time of listening to the book. The reader and the production were excellent. A perfect example of a British mystery. A bit more somber than an Agatha Christie, less of mystery than a character-driven narrative. There is a lot about horses, raising and riding, which was not interesting me but was the backdrop for the milieu in which the story takes place. The narrator was excellent. Lovely narration, but even in print this would have been an absolute pleasure to read. A cosy crime, that all of a sudden isn't all that "cosy" anymore. Wonderful character descriptions and a time and place you want to be transported to. Great! Loved it. Fascinating plot. Engaging characters. I listen to dozens of books each year and this was by far the best in years. Looking forward to more by the same author. Loved the story, loved the presentation. This is the first thing I've read by Tey and plan to listen/read the rest. After I finished the book I listened a second time- I've never done that before. Perhaps because of her more modest output—eight novels, compared to Sayers’ twelve, Marsh’s thirty-two and Christie’s seventy-three—most of us don’t include Josephine Tey in the charmed inner circle of writers from the Golden Age of English Mystery. But she deserves a niche. Her work stands apart from those other masters in more than mere tonnage. In the case of Brat Farrar, the very shape of the story came as something new. And I learned a lot about horses, too. In many mysteries, you can almost sense the first big break and the final red herring. Admittedly, that’s part of the enjoyment; just as a song can sound incomplete without a bridge, a mystery without the chapter where all the leads have gone cold might disappoint. And, as if that wasn’t enough, our reader here, Carole Boyd, is simply superb. Her performance is as effortless as the prose she’s reading, and as spot-on as if she’d written the words herself. At last! What a joy to find the real Josephine Tey books on Audible. And Bratt Farrar is one of her best. In theory, one ought to thoroughly dislike a young man who sets out to deceive, but Bratt is such a sympathetic character that the listener can't help but be drawn into his story, and that of the family who welcome him 'home'. Even though I had read the book and knew the outcome, it was a real pleasure to hear it read aloud, and Carole Boyd makes an excellent job of it. Please, Audible, do let's have all of Josephine Tey's books made available. I have loved this book since I first read it in my teens and that was a long time ago! I was delighted to find this audio version, read by the excellent Carole Boyd. My pleasure in following the ramifications in the Ashby family when their nephew/brother, thought to have killed himself when young, turns up again just before he is due to come into his inheritance was undimmed. Do you remember the last summer you were a "kid", before you became supposedly a grown up, when you felt as though you were on the verge of your life really beginning? That's the feeling this book evokes. A young man, torn between undreamed-of opportunity and a moral awakening is at such a turning point in his life in this wonderful old-fashioned adventure story. It has everything such a story should contain and more besides: a morally ambiguous hero, painfully establishing his own values in extraordinary circumstances, a fearless heroine, a villain hiding in plain sight, a kindly family lawyer, little sisters providing comic relief, an angry killer, a kindly mother figure whose integrity discomforts the hero more than any threat or attack could. "How on earth" you find yourself asking, "is this possibly going to be sorted out?" And you find yourself really caring. Dishes are left unwashed, housework undone, you are late in to work because you have to sit in the car those few extra minutes just to get to the end of the chapter. Read this book and make your excuses. Great story, especially if you enjoy horses, a nostalgic era and the countryside, a truly English story. Excellent narration. Thoroughly recommended. Yes, I would recommend this audiobook to a friend, because it takes the 'missing heir' trope to yet another level. As a listener, you think the imposter is cheating the family of what belongs to it; however, it is because of his imposture that a crime is revealed and a criminal punished. Aunt Evie--there was something very humane and loving about her. Have you listened to any of Carole Boyd’s other performances? How does this one compare? No, I don't think I have--but I will look out for them. When Evie and Charles discover/uncover Brat's identity. Josephine Tey at her best. An easy listen which isn't to say that this isn't a gripping story very well told. Really strong audio version of a favourite book. The narrator was excellent and really brought the characters to life. I know I’m biased as I love anything by Josephine Tey and Brat Farrar certainly doesn’t disappoint. This book is a real treat. ...otherwise an excellent mystery. I just can't stand how often the author has characters who are meant to be sympathetic protagonists use the word "moron", frankly. I grit my teeth every time I hear it. I get that ableist language as insults were more or less the norm for her generation and unexamined as such, but that doesn't make it at all pleasant to hear in this century. The sub-plot involving Sheila Parslow & the characters' attitudes toward her comparative promiscuity also makes me cringe. Other than that, I enjoy re-reading this particular mystery in various forms. I don't think I shall ever be able to forget the solution, so I re-read with 20-20 hindsight every time, but the story is just as interesting and nuanced when you already know the ending as it is when you know nothing about it - and with such hindsight the author's subtle but clear foreshadowing is easy to discover and to enjoy. I can assure you of that much!